Syncios Data Recovery can help you to find and recover previous SMS, bookmarks, call history, contacts whatsapp messages as well as lost photos and videos and more. 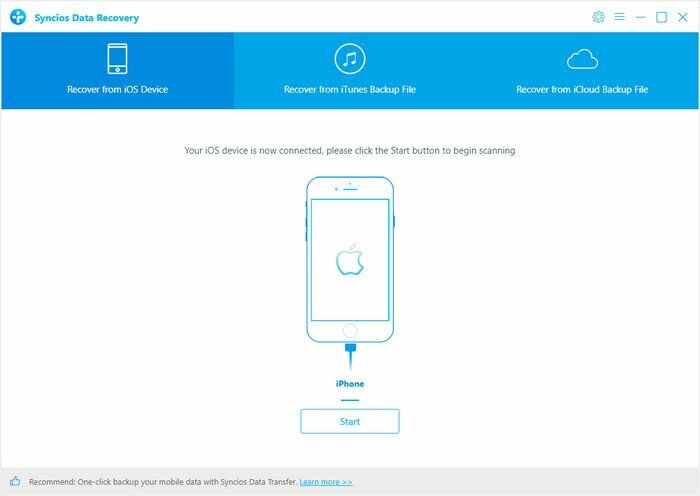 Run Syncios Data Recovery, you will see the Home interface providing three recovery modes, click on 'Recover from iOS Device', you will get the connecting your device to PC prompt. 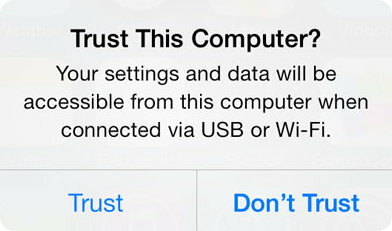 Connect your iPhone, iPad or iPod Touch to the computer with USB cable once detected and analyzed successfully, you will get the following interface. After click 'Start' button below your device name, the program will begin to analyze and scan the device connected. Once you are in, please kindly wait for some time for the program to finish scanning your device. During the scan, please keep your device connected, otherwise the progress will terminate and you have to start it over again. Once the program finish scan, the found data is categorized in main three types: Photos & Videos, Messages & Call logs, Memos & Others. You can click on each tab to switch and preview the found data, then recover the files selectively. You can choose your saving path to computer or on device. 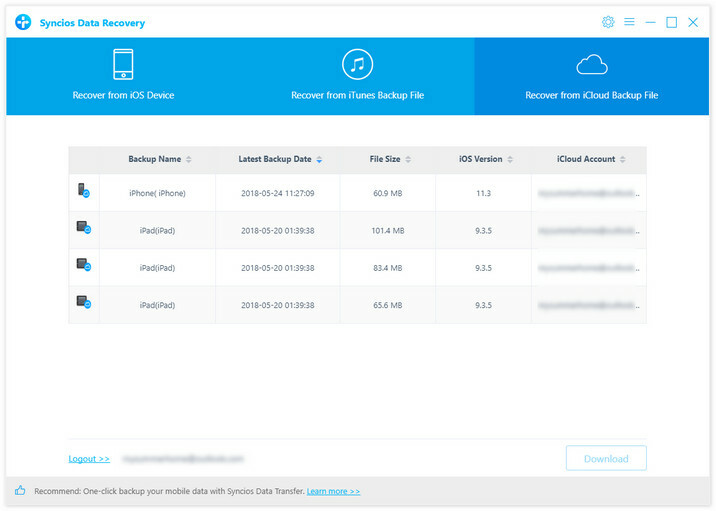 Retrieve lost iPhone, iPad & iPod Touch data from iTunes backup. Please select the Recover from iTunes Backup File option on the top after running Syncios Data Recovery. Then you can see the program displayed all the iTunes backup files for your iPhone, iPad and iPod touch in a list as follows. Choose the one you would like to access and click 'Start Scan' button when it comes up to enter into the next step. 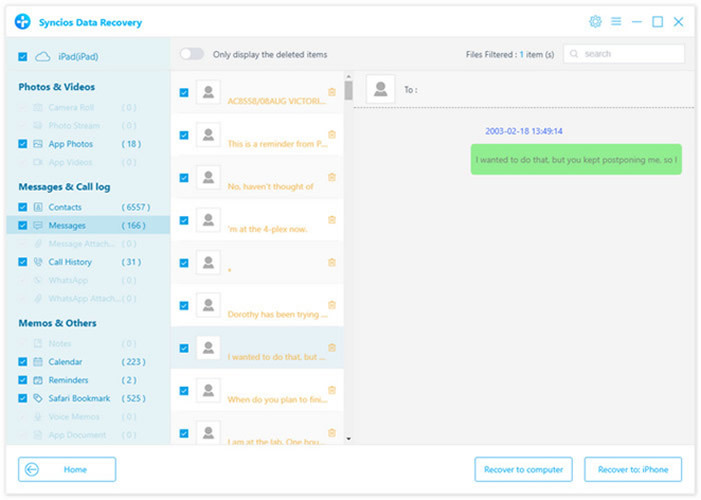 There are two forms you can choose to recover the data, recover to computer or recover to device. 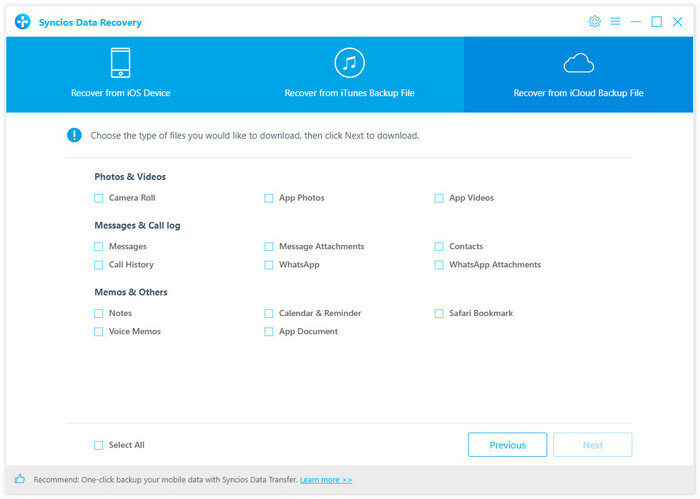 Currently, Syncios Data Recovery supports recovering Camera Roll, Photo Stream, Contacts, Messages and attachments, Call History, WhatsApp, Notes, Bookmarks and voice Memos to device. We will continue to support more file types. 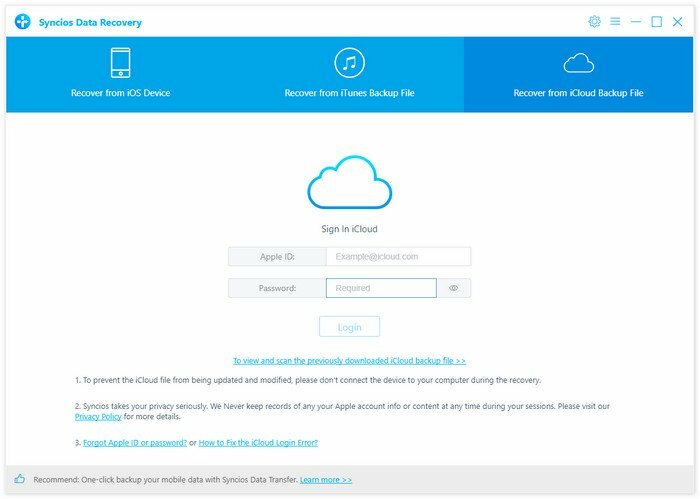 Recover data from iPhone, iPad & iPod touch with iCloud backup. All iCloud backup files will be loaded and listed. Choose the one you want to access and click 'Download' under the column of State. 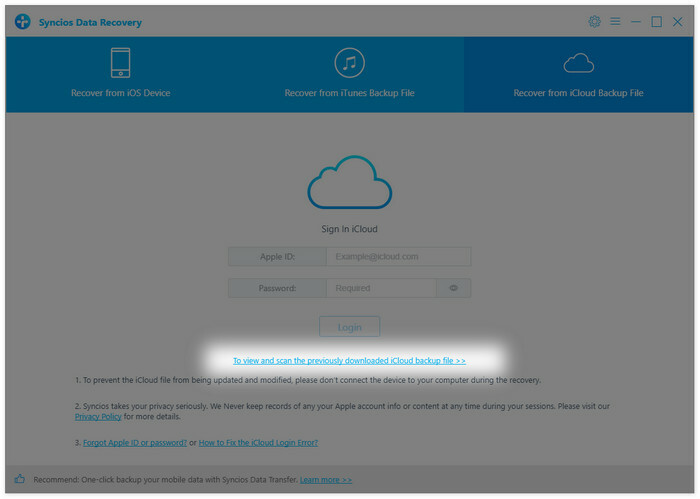 You will get a pop-up asking you to select file types from the iCloud backup you would like to download. Simply tick the ones you need, this would save you much time if you just would like to download parts of the files. 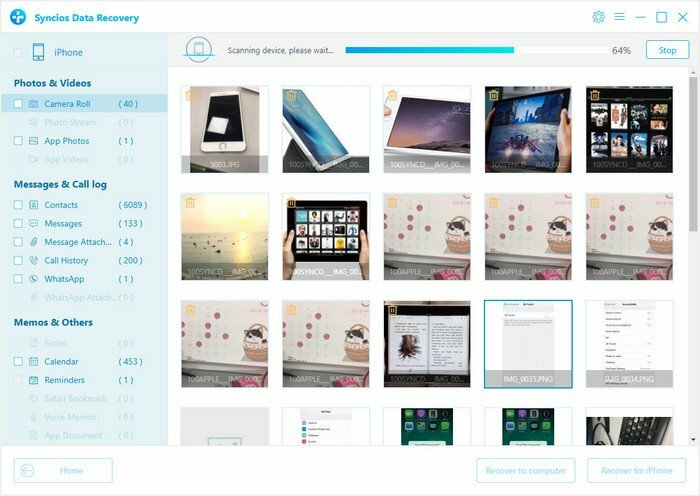 The final step is to take a glance at your content thumbnails in your iCloud backup file. Choose what to retrieve and choose your saving path by select 'Recover to Computer' or 'Recover to Device' button which are located at the bottom of the program panel. You can easily save all of them to your computer or directory put them back to device. 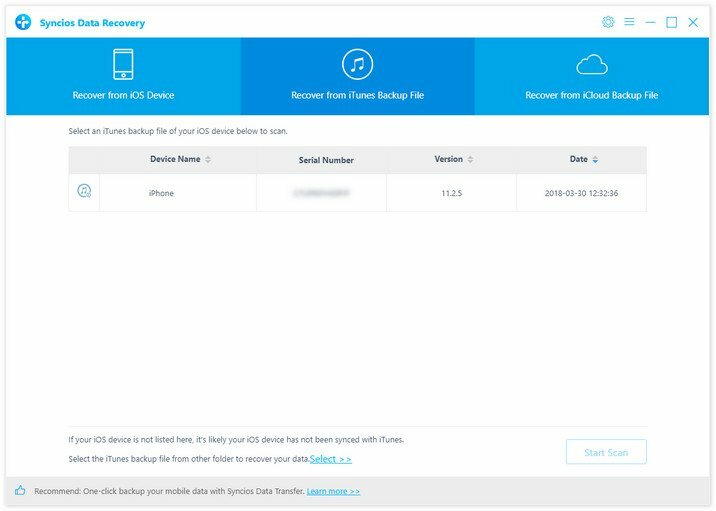 In addition, you can delete the iCloud backup files downloaded after recovery.